Profiler Tony Hill and DCI Carol Jordan are on the hunt for a serial killer who victimizes women at weddings without a date--and forces the duo to confront their most haunting moral dilemma so far. In the north of England, single women are beginning to disappear from weddings. A pattern soon becomes clear: Someone is crashing the festivities and luring the women away--only to leave the victims' bodies in their own burned-out cars in remote locations. Tony and Carol are called upon to investigate--but this may be the toughest case they've ever had to face. Meanwhile, Detective Sergeant Paula McIntyre and her partner Elinor must deal with a cruel cyber-blackmailer targeting their teenage ward, Torin. Seven years ago, Val McDermid was awarded the CWA Cartier Diamond Dagger for "outstanding lifetime's contribution" to the crime and mystery genre. 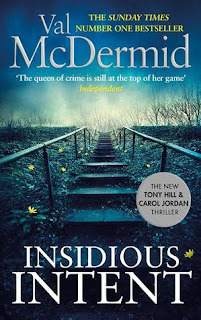 It was an inarguable accolade for an absolute titan of modern-day crime writing: at that stage McDermid had published 25 novels (across four different series and standalones), sold millions of copies, seen her novels adapted for television, won the CWA Gold Dagger among many other accolades, pioneered diversity in crime writing protagonists, and more. But here's the twist: rather than resting on her laurels or easing down a gear by putting out good but samey tale after tale , McDermid keeps vaulting at and over the incredibly high bar she's set herself. The Queen of Crime keeps pushing the boundaries with her characters and stories; epitomised by Insidious Intent, the tenth instalment in the adventures of Chief Inspector Carol Jordan and eccentric profiler Tony Hill. A series that's delighted, terrified, and seat-laminated readers for 22 years. A charred skeleton in a burned-out car in the northern countryside poses plenty of challenges for Jordan and her handpicked new regional major incident team (ReMIT). It’s their first case, but the vultures are already circling, both in the media and within the police force itself. Plenty of people would be happy if the new initiative, and Jordan, failed. So when progress is slow, even Hill is stumped, and another burned body turns up, the thermostat is dialed high. Meanwhile Jordan's long-time colleague DS McIntyre is under family strain, and Hill dances a tricky two-step, as a psychologist and close friend, as Jordan battles her alcoholism. The case is bad enough, as missing women seem to have fallen prey to a deadly Romeo, but the personal lives of the characters we've come to know and care about are under immense strain too. McDermid puts her characters and the reader through the emotional wringer with Insidious Intent. The latest novel in a long-running series is both a terrific individual read and a culmination of ongoing character arcs throughout the books. 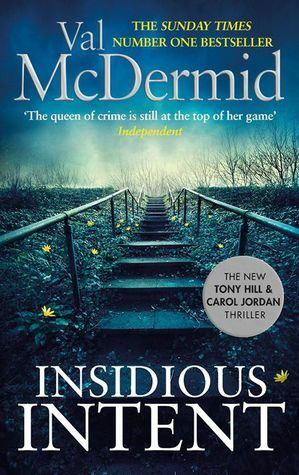 McDermid is a maestro still at the top of her game, and adroitly balances shock and inevitability as events for beloved characters take a dark turn.